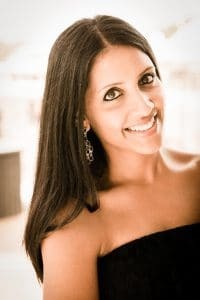 Check out my Guest Post on a 3-Course Valentine’s Day Menu over at Chai Mommas! I had the pleasure of meeting Puja, one of the mothers over at Chai Mommas, a few months ago at a dinner party through mutual friends! When she asked me if I would like to do a Guest Post for them on a 3-Course Valentine’s Day Meal, I was extremely excited! After weeks of contemplating different menu ideas, developing the components for each course, and testing them out in my kitchen, I came up with this elegant, delicious menu for Valentine’s Day that is full of flavor for you and your loved one to enjoy at home! 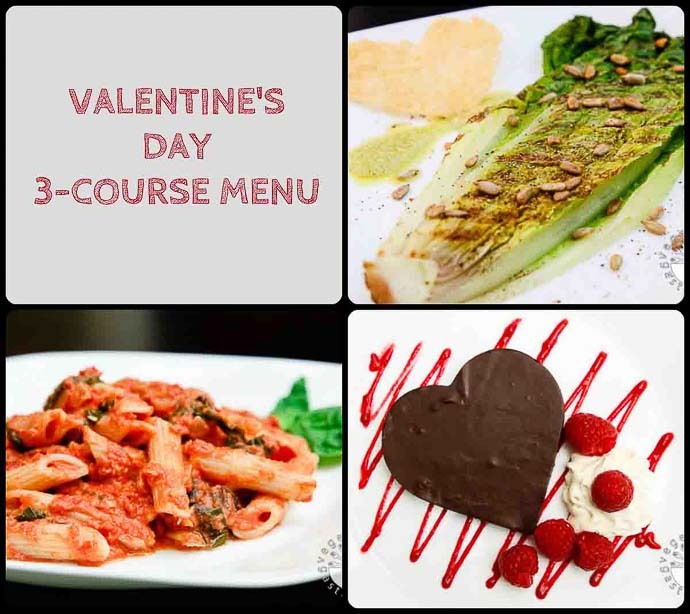 Here are a few pictures of the 3-Course Valentine’s Day Meal! You’ll find the recipes on my Guest Post for Chai Mommas! Valentine’s Day always reminds me to show my feelings of love, affection, and friendship. Although these are feelings we should be showing every day, sometimes in our busy and hectic lives with kids, work, and all the other tasks we have on our to-do lists, we need to be reminded to stop and take the time to think about the simple things in life and cherish those we have around us. For me, this day means spending time with my husband and two kids. One of my favorite things to do on Valentine’s Day is to make a 3-course dinner for my husband. I’ve always loved cooking for him, but especially now more so than before. After having kids, it’s nice to be able to enjoy a nice candle-light dinner at home, after the kids go to bed, without having to hassle with reservations on Valentine’s Day. If you’re thinking to yourself that there’s no way I can create this in my own kitchen, or that you don’t have the time, or that these recipes must be complicated…I promise to prove you wrong! The appetizer was adapted from Fat-Free Vegan. 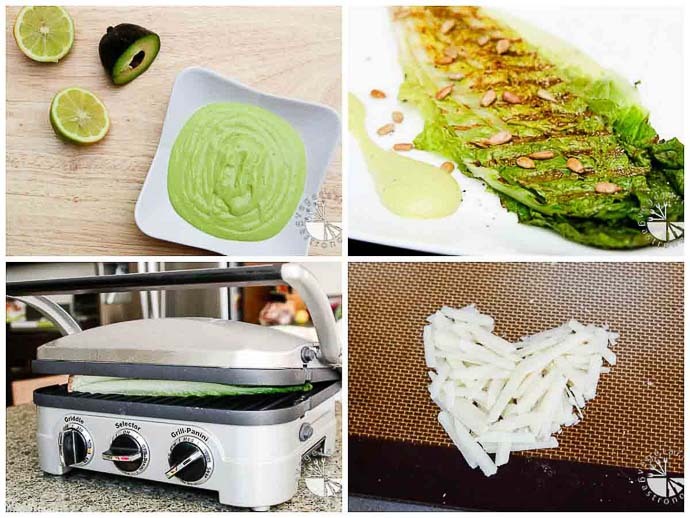 When I saw their recipe for a grilled romaine salad, I was intrigued because it consisted of literally grilling the entire heart of a romaine lettuce! Let me jump ahead of myself and tell you that I had this salad for lunch 4 days in a row after trying it out for the first time…it was that delicious and that easy to make! 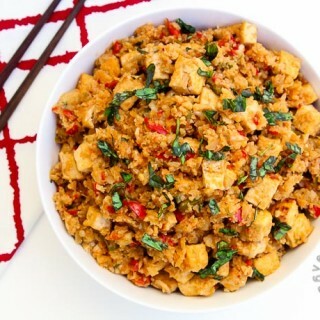 I made a few changes to the original recipe by adding more flavor and more elements to the dish. I added more white balsamic vinegar and used toasted/salted sunflower seeds instead of raw sunflower seeds. I also made an avocado-lime dressing to compliment it on the side, which you can easily the day before. To give the salad more depth, I served it with a heart-shaped Parmesan crisp on the side! So simple, yet very elegant and tasty…the perfect start to a meal! When trying to come up with the perfect entree, I had a few ideas in mind, but my taste buds kept pulling me back to one of my favorite Italian Dishes…Penne a la Vodka! This sauce is my absolute favorite and extremely easy to make at home! If you don’t have vodka at home or prefer not to use alcohol in your cooking, you can easily omit it as I’ve done several times in the past. It still tastes just as great! 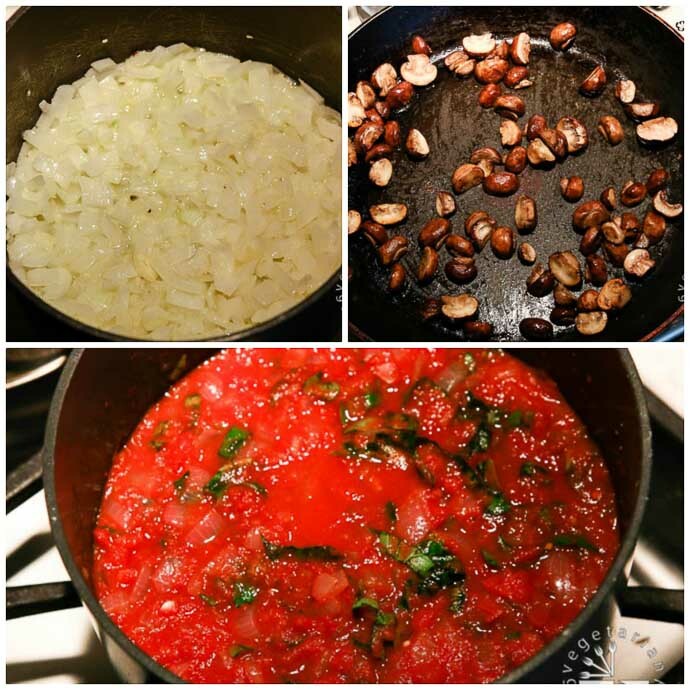 This sauce is very easy to prep and can easily be made ahead of time as well. A Valentine’s Day meal would not be complete without a rich decadent dessert. Once again, I couldn’t steer my mind away from one of my favorites, dark chocolate! I recently came across this amazingly easy to make Vegan Chocolate Fudge recipe from Katy’s Kitchen. Not only was this fudge one of the best tasting I’ve ever had, but it was also vegan and much easier to make! When I thought of serving rich dark chocolate fudge for dessert, two other flavors came into mind…raspberry and coffee. I balanced the richness of the chocolate fudge with a raspberry sauce and added more texture by making a tiramisu mousse! You can easily make all three components of this dessert a few days in advance and just assemble it prior to serving. So this year, instead of making dinner reservations somewhere or trying to find the perfect gift, surprise your loved one with this perfect 3-Course Meal and enjoy a nice, relaxing candle-light dinner at home! It’s the perfect way to spend Valentine’s Day! For The Dressing. Add all of the ingredients for the salad dressing into a food processor or blender. Start off by adding only 3 Tbsp. of lemon juice and increase as needed depending on the acidity of your lemons. Blend all the ingredients until completely smooth. Refrigerate until you are ready to serve. For The Parmesan Crisp. Line a baking tray with parchment paper or a silpat. Place about 2 Tbsp. of the grated Parmesan cheese onto the tray. Lightly pat it down and form it into the shape of a heart. Repeat with the remaining 2 Tbsp. Parmesan cheese so that you end up with two crisps. Bake in the oven for about 5-7 minutes until golden and crisp. Remove and cool. Note that depending on how the cheese melts, the end shape of the crisp may not look like a heart. If this is the case, use a sharp knife and carefully trim the crisp into a heart-shape if you prefer. To Grill the Lettuce. Cut the romaine heart in half lengthwise. Heat your Griddler or stove-top grill pan to medium-high heat. Lightly spray some olive oil on the Griddler or pan to keep the lettuce from sticking. Place one half of the lettuce face down on the grill. If you are using a Griddler, close the top of the grill. If you are using a grill pan, lightly press down with a spatula. Grill for a few minutes until the lettuce begins to wilt and grill marks start to appear. If you are using a grill pan, gently flip the lettuce over and grill the other side. Repeat with the second lettuce half. To Assemble the Salad. Place each grilled romaine lettuce half on individual plates, cut side up. Drizzle 1 teasp. white balsamic vinegar on top of each lettuce half and sprinkle with some sunflower seeds and freshly ground black pepper. Spoon a generous helping of dressing next to the grilled lettuce and serve warm with the Parmesan crisp! In a medium non-stick pot, heat 1 Tbsp. olive oil and 1 Tbsp. butter on medium heat. Add the garlic and onions and sauté until the onions start to become translucent. If you are using vodka, stir it in and cook for 10-15 minutes. Stir in crushed tomatoes, basil, salt, and pepper. Bring to boil and simmer uncovered for about 15 min. In the meantime, in a non-stick pan heat 1 Tbsp. olive oil on medium heat. Add the mushrooms and sauté until all the water is released and the mushrooms just begin to brown/roast. Sprinkle some salt and set aside. Stir the cream into the sauce and cook for about 20 min or until the sauce has thickened to liking (note that if you are using cashew cream, you may only need to cook for a few minutes to get the desired thickness). Add Parmesan cheese (if using) and red crushed pepper. Simmer for an additional 5-10 minutes. In the meantime, boil the Penne pasta al dente. Drain and set aside. Add the sautéed mushrooms into the sauce. 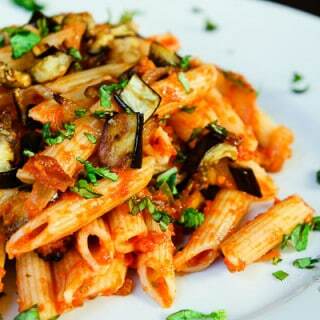 Serve the sauce over Penne pasta and serve hot! To Make Cashew Cream (vegan option): Soak 1/4 cup raw cashews overnight. Combine the cashews with about 1 cup water in a blender and blend until smooth and creamy (this may take a few minutes). Use this entire amount in the recipe to replace the 1 cup of heavy cream. To Make the Vegan Fudge. Line an 8×8 square baking pan or glass tray with parchment paper. In a saucepan, heat the coconut milk on medium heat until it starts to simmer. Add the coconut oil and whisk to combine. Add the chocolate chips and slowly whisk until all the chocolate is melted and completely smooth. Pour into the lined pan. Refrigerate for at least 6 hours or overnight. Remove the parchment paper out of the pan (the fudge will come out with it, holding shape). Carefully peel the paper off and cut the large block of fudge into desired shapes (I used a heart-shaped cookie cutter). Store in the fridge until ready to serve! To Make the Mousse (omit for vegan option). Place a large mixing bowl in the freezer for a few minutes to chill. Combine the mascarpone cheese, heavy whipping cream, coffee liquor, and confectioners’ sugar in the chilled bowl (note that the heavy whipping cream should be cold from the fridge, not room temperature). Whip everything together using an electric hand mixer on medium-high speed until it forms stiff peaks. Store the mousse in an air tight container in the fridge until ready to serve. To Make the Raspberry Sauce. In a medium saucepan, combine the raspberries, sugar, water, and salt and stir over medium heat for about 5-10 minutes until the mixture becomes thick and has a sauce-like consistency. During this time, slightly mash the raspberries with a fork. Puree in a small blender until smooth. Press the puree through a fine mesh or strainer to remove all of the seeds in the sauce. Cool the sauce and store in the fridge. To Assemble. Note that these assembly instructions are just guidelines. Feel free to assemble the dessert as you like. 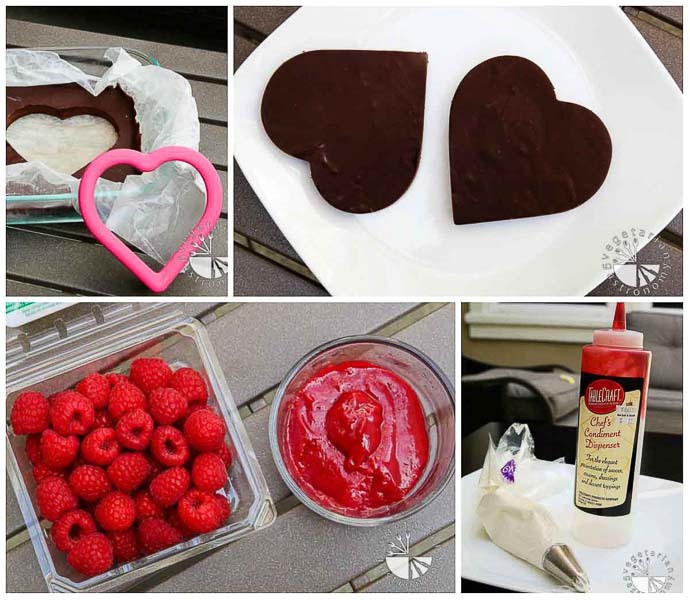 For best results remove the heart-shaped fudge from the fridge 10-15 minutes prior to serving it. The fudge is best served at room temperature. Using a condiment dispenser or piping bag (see notes below), drizzle the raspberry sauce on the plate in a zig-zag fashion starting from one corner and ending in the opposite so that you cover the entire plate. Alternately, you can spoon the sauce onto the plate in any shape or pattern. Place each heart-shaped fudge piece on top of the raspberry drizzle near the middle of the plate. Pipe or spoon some of the tiramisu mousse on the side of the fudge (see notes below) and dust some cocoa powder on top (if using). Top with some fresh raspberries and serve immediately! For the fudge chocolate, you can use vegan semi-sweet chocolate chips (available at Trader Joe’s), or dark chocolate chips (I used Ghirardelli 60% cocoa, but these are not vegan). You can also purchase a 12 oz. vegan dark chocolate bar and chop it up into small pieces before adding it into the mixture. To drizzle the raspberry sauce in a uniform pattern as the picture shows above, you can purchase any plastic condiment dispenser for really cheap (I purchased mine for $1.50 from my local cake decorating store). You can also use a piping bag with a small round tip. Alternately, you can fill the raspberry sauce in a zip-lock bag and cut a small hole in one corner and squeeze it out in a uniform shape. I used a 1M tip and piping bag to pipe the tiramisu mousse onto the side of the fudge (as shown in the picture).